JHIRPU PHULPINGKATT, Nepal , Jun 2 2013 (IPS) - Residents of Jhirpu Phulpingkatt, a village nestled in the foothills of the Himalayas, about 110 km from Nepal’s capital Kathmandu, are on red alert. As the impacts of climate change batter the towering mountains above them, these villagers on the banks of the Bhote Koshi river have started to dread the sound of incoming text messages, which may carry evacuation warnings. Their fears are not unfounded. 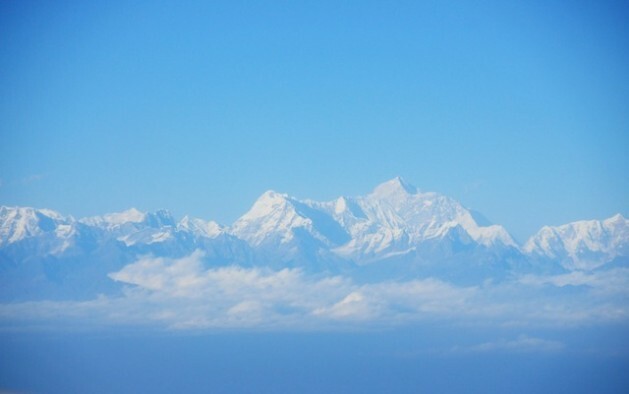 Research conducted by experts from the University of Milan shows that the snowline in the Everest region of the Himalayas, also known as the Khumbu region in the northeast of Nepal, has receded by 180 metres in the last 50 years, while glaciers have shrunk by 13 percent. Sudeep Thakuri, who led the Italian team of researchers, told IPS that the continuous and increased melting is most likely caused by rising temperatures, which were 0.6-degrees Celsius higher this year than they have been in previous years. Together, the two phenomena have led to the proliferation of massive glacier lakes – melting ice held back by natural dams of moraine and debris – that could spell disaster for those living in the rocky ravines down below. Avalanches, erosion, heavy water pressure and even snowstorms could cause glacial outbursts, “releasing millions of cubic metres of water in a few hours (resulting in) catastrophic flooding downstream”, according to a study by Germanwatch, an NGO dedicated to sustainable development. Glacier lake outbursts are not uncommon, and over the last century scientists have recorded at least 50 incidents of these icy lakes breaking their dams. One of the most devastating incidents occurred when the Sangwang Cho glacial lake in Tibet burst in 1954, flooding the cities of Gyangze (located 120 km downstream), and Xigaze (about 200 km away). Now experts warn that the lakes are filling up faster than ever before and new lakes are being created at an alarming rate. According to ICIMOD research, there are over 20,000 glacial lakes in the Hindu Kush Himalayas, stretching from Afghanistan in the west to Myanmar (formerly Burma) in the east. The Dudh Kosi river basin in eastern Nepal is home to 278 glaciers, some of which are receding at a rate of 74 metres annually. Mool told IPS that the region is now home to 34 lakes, including 24 recent formations, of which ten have been tagged as potentially dangerous. Mool warned that earthquakes also pose a serious threat. “The Hindu Kush Himalaya region is one of extreme seismic instability. Earthquakes could act as major triggers for glacial lake outbursts,” he stressed. There has been at least one reported lake outburst in the last 500 years in the Seti Khola region that was triggered by seismic activity, the scientist said. That outburst produced a 50-metre-high debris field in the western region of Pokhara. According to Thakuri, the future wellbeing of glaciers is largely dependent on the climate, adding that much more concrete scientific research is required to determine possible outcomes. But those living in the Himalayan foothills, like the villagers of Jhirpu Phulpingkatt, say there is evidence enough of the possible disasters to come. The steep mountain walls in this village, mostly covered in lush vegetation, are frequently disrupted by deep cave-ins caused by earth slips that follow heavy rains. At the small power plant that lies just next to the Bhote Koshi river, officials rely on a warning system to give residents adequate notice to escape any lake outbursts. However the plant’s acting manager, Janak Raj Pant, told IPS that the warning would only give an escape window of between six and 10 minutes, and extends only to the Nepali border, which is just 10 km from the plant. But many of the glacial lakes that could impact this village and others lie in Chinese-controlled Tibet, where the warning system does not reach. ICIMOD’s Mool told IPS there is an urgent need for better monitoring of lakes and their water levels. He pointed to a few isolated examples in which outlets have been cut into the dams of some glacial lakes in Nepal and Bhutan to let out excess water, but Mool said such preventive action needed be more uniform. There is also an economic imperative to take action, at least in the Bhote Koshi valley, where Nepali authorities are planning to build at least four new power plants on the river. If climate warming continues, as is predicted,.. It’s not warmed formover ten years and it is now cooling. Misinfo and lies from the CO2 tax fraudsters. Crops are producing much more food now with higher CO2. BTW CO2 follows warming by 800 years. And.. check out Arctic ice! Biggest everr measured gaiin in any Feb. and still gowing in April! You are cherry picking your facts. Tax fraudsters? Really? How? Be more careful about reviewing ALL the facts than you are with your writing. climate change is real and driven by man. We have co2 now above 400 ppm, a rise of 130ppm in less that 200 years. A hugh rise where the global climate is adjusting to this atmoshperic change. Sea temp – mean average, seasonal, regional in what ever measure you want to consider have risen over the past few decades. I need some one to tell me where all the energy required to raise the sea temperture by even part of one degree has come from. (that is masny billions of litres of water) If not from global warming occuring as a consequence to increased co2 concentration then from what source? the obvious in you face impact of global warming is there for all to see if they walk in their environment. Trees in flower early (by 4, 6 even 8 weeks) is just one so obvious example that can be seen in every country. Just because the inability to exactly predict a specific regional response does not invalidate global warming. Global climate is complex and changing and models have difficult in getting it right but the trend is very clear. The upward tren in temperature is matched with the downward tend in ice (at every location). It is changing through increased co2 concentration with the direct result of increased surface and atmospheric temperatures.